The group mainly focuses on two themes: One is on the research related to visual optics and functions of the cornea, lens, intraocular lens, and the other is on the control of progression of myopia. Regarding the first theme of the group, on the basis of the results of the basic optical analysis, we are trying to improve quality of vision, and aim to construct the ideal optical system for the human eye in daily activities. Regarding the second theme, we carry out clinical and basic research about myopia and our ultimate goal is to elucidate the etiology of myopia, retard myopia, and decrease the cases of blindness caused by high myopia in the future. Based on previous and current research results and experience, our focus is on the development of new diagnostic machines and therapeutic instrument for retardation of myopia, and the improvement of the surgical devices, such as intraocular lenses. We retrospectively evaluated surgically induced changes in corneal, internal, and ocular higher order aberrations after phakic intraocular lens (pIOL) implantation and compared them between two pIOLs (Artisan and Artiflex) with different pupillary diameters. With the 4- and 5-mm pupillary diameters, the postoperative internal and ocular spherical aberrations (SAs) (Z40) were significantly lower in the Artiflex group than in the Artisan group (4 mm, P=0.002, P=0.024; 5 mm, P=0.004, P=0.022, respectively) (Figure 4). The postoperative ocular SA was greater in the Artisan group possibly due to differences in the SAs of both pIOLs (Torii H. et al. J Refract Surg. 2013). With the 4- and 5-mm pupillary diameters, the postoperative internal and ocular spherical aberrations (SAs) (Z40) were significantly lower in the Artiflex group than in the Artisan group (4 mm, P=0.002, P=0.024; 5 mm, P=0.004, P=0.022, respectively). We reported 3 cases with deep corneal stromal opacity that occurred several months after corneal crosslinking. Deep stromal opacity developed several months after uneventful corneal crosslinking. Postoperative inflammation may play a crucial role in its pathogenesis（Kato N. et al. Cornea. 2013）. A retrospective nonrandomized comparison of the rates of myopic regression 3 years after pIOL implantation and laser in situ keratomileusis (LASIK) after matching the preoperative axial length in highly myopic eyes of Japanese patients included 133 eyes with myopia exceeding -6.00 diopters (D) (Figure 5). 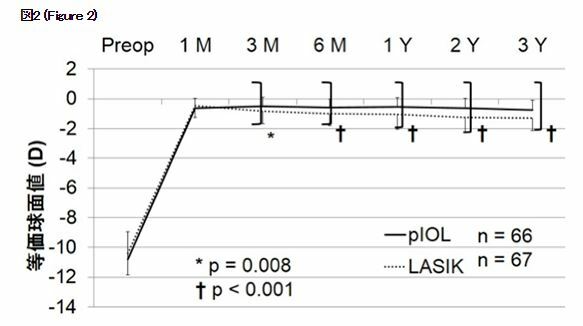 The mean regression values after 3 years compared with the 1-month postoperative refractions were -0.12 D in the pIOL group and -0.82 D in the LASIK group (p<0.001) (Torii H. et al. Optom Vis Sci. 2014). Figure 2　Changes in the SE in all patients over time. The SE values in the LASIK group are significantly (p = 0.008, p < 0.001, p < 0.001, p < 0.001, and p < 0.001, respectively) more myopic than those of the pIOL group at 3 and 6 months and 1, 2, and 3 years after surgery. 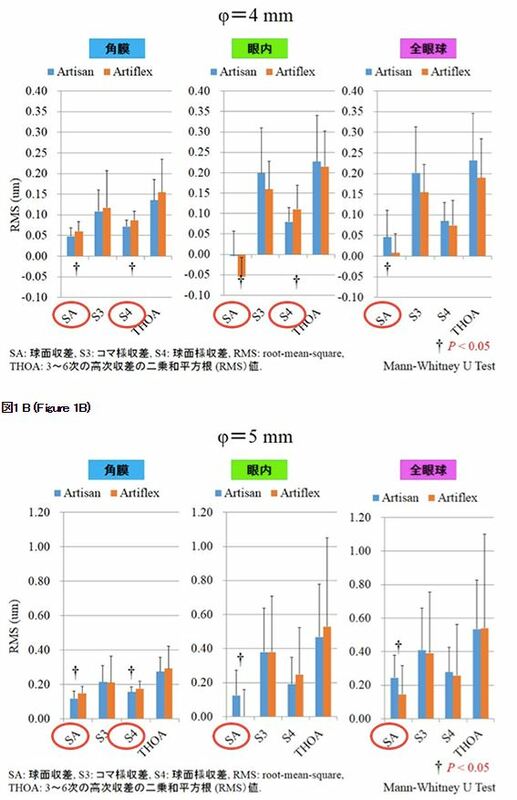 We evaluated the axial elongation for 5 years after implantation of an iris-fixated phakic intraocular lens (Artisan) in Japanese eyes. Axial elongation for 5 years was confirmed after Artisan implantation, although the long-term refractive stability of the Artisan pIOL has been reported (Torii H. et al. International Myopia Conference 2013). Intraocular lens (IOL) power calculations in eyes that underwent previous corneal refractive surgeries tend to be inaccurate. We a new IOL power calculation formula applying the concept which peripheral and posterior corneal curvature does not change by LASIK, in which we could estimate corneal curvature before LASIK from that after LASIK using regression formula obtained from other patients. (Saiki M, et al. Acta Ophthalmol. 2013, Saiki M, et al. J Cataract Refract Surg. 2013). We develop computer software to use second method using postoperative posterior corneal curvature with a wide clinical application. This software is installed to Pentacam Scheimpflug anterior segment imaging system (Oculus) and widely used around the world. Ayaki M, Hattori A, Maruyama Y, Nakano M, Yoshimura M, Kitazawa M, Negishi K, Tsubota K. Protective effect of blue-light shield eyewear for adults against light pollution from self-luminous devices used at night. Chronobiol Int. 2016 Jan;33(1):134-9. Negishi K, Masui S, Mimura M, Fujita Y, Tsubota K. Relationship between Functional Visual Acuity and Useful Field of View in Elderly Drivers. PLoS One. 2016 Jan 25;11(1):e0147516. Ayaki M, Toda I, Tachi N, Negishi K, Tsubota K. Preliminary report of improved sleep quality in patients with dry eye disease after initiation of topical therapy. Neuropsychiatr Dis Treat. 2016 Feb;16;12:329-37. 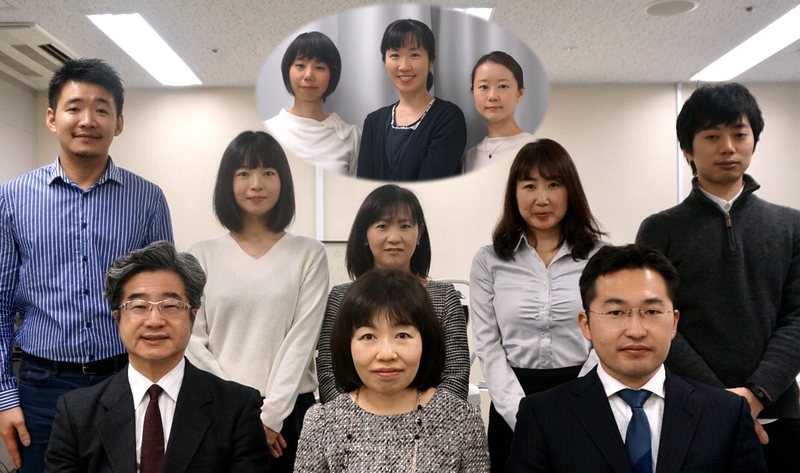 Ayaki M, Kawashima M, Kishimoto T, Mimura M, Negishi K, Tsubota K. Sleep and mood disorders in dry eye disease and allied irritating ocular diseases. Sci Rep. 2016 Mar 1;6:22480. Yotsukura E, Torii H, Saiki M, Negishi K, Tsubota K. Effect of neodymium:YAG laser capsulotomy on visual function in patients with posterior capsule opacification and good visual acuity. J Cataract Refract Surg. 2016 Mar;42(3):399-404. Katada Y, Negishi K, Watanabe K, Shigeno Y, Saiki M, Torii H, Kaido M, Tsubota K. Functional visual acuity of early presbyopia. PLoS ONE. 2016 Mar 9; 11(3): e0151094. Yaguchi Y, Yaguchi S, Yaguchi S, Kozawa T, Tanaka Y, Negishi N, Tsubota K. Objective Evaluation of Zonular Weakness: Measurement of Lens Movement at the Start of Capsulorhexis Using Extracted Porcine Eyes. J Clin Exp Ophthalmol. 2016, 7: 541. Hidaka Y, Yamaguchi T, Saiki M, Dogru M, Tsubota K, Negishi K. Changes in corneal aberrations after cataract surgery. Jpn J Ophthalmol. 2016 May;60(3):135-41. Ayaki M, Shiba D, Negishi K, Tsubota K. Depressed visual field and mood are associated with sleep disorder in glaucoma patients. Sci Rep. 2016 May 11;6:25699. Onishi H, Torii H, Watanabe K, Tsubota K, Negishi K. Comparison of clinical outcomes among 3 marking methods for toric intraocular lens implantation. Jpn J Ophthalmol. 2016 May;60(3):142-9. Yaguchi Y, Negishi K, Saiki M, Torii H, Tsubota K. Comparison of the accuracy of intraocular lens power calculations for cataract surgery in eyes after phototherapeutic keratectomy. Jpn J Ophthalmol. 2016 Sep;60(5):365-72. Tounaka-Fujii K, Yuki K, Negishi K, Toda I, Abe T, Kouyama K, Tsubota K. Effects of laser in situ keratomileusis on mental health-related quality of life. Clin Ophthalmol. 2016 Sep 26;10:1859-1864. Ayaki M, Torii H, Negishi, K, Tsubota K. Decreased sleep quality in high myopia children. Sci Rep. 2016 Sep;21;6:33902. Yotsukura E, Torii H, Saiki M, Negishi K, Tsubota K. Reply. J Cataract Refract Surg. 2016 Sep;42(9):1392-1393..
Ayaki M, Kawashima M, Negishi K, Kishimoto T, Mimura M, Tsubota K. Sleep and mood disorders in women with dry eye disease. Sci Rep. 2016 Oct;12;6:35276.